One of the things I love most about cookbooks is the near instant gratification I get after cracking open the book. There’s no reading the first chapter or reading the end of the book before reading the middle (I was guilty of this as a child). One quick look of the recipes can usually tell me whether or not a book belongs on my shelf. I picked up Cheryl’s Yogurt Culture book in anticipation of her coming to Sacramento for a book party. I cracked it open and upon a couple flips, landed on these chocolate yogurt pots. To say I became excited is a bit of an understatement. I love chocolate mousse but it’s a rare treat because it feels a bit more decadent than the average week deserves. 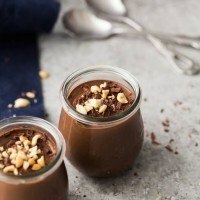 These yogurt pots, after being chilled, have a similar texture that leaves one feeling like they’ve eaten the richest dessert when really, it’s just yogurt and melted chocolate. M and I are a bit addicted to the peanut butter/chocolate combination so I altered her recipe slightly to include a fluffy peanut butter center. I think almond butter would also be amazing. However, if you’re just a straight chocolate fan, make Cheryl’s recipe as is- you won’t be disappointed. 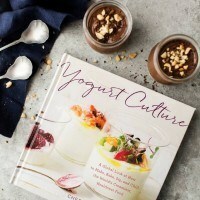 About the Book: Yogurt Culture is exactly what you could imagine: a book all about yogurt and recipes using yogurt. There’s over 100 recipes for every meal and a set of solid yogurt making instructions. When Cheryl came to Sacramento, I had the opportunity to chat with her and one thing was apparent: she is excited about yogurt. 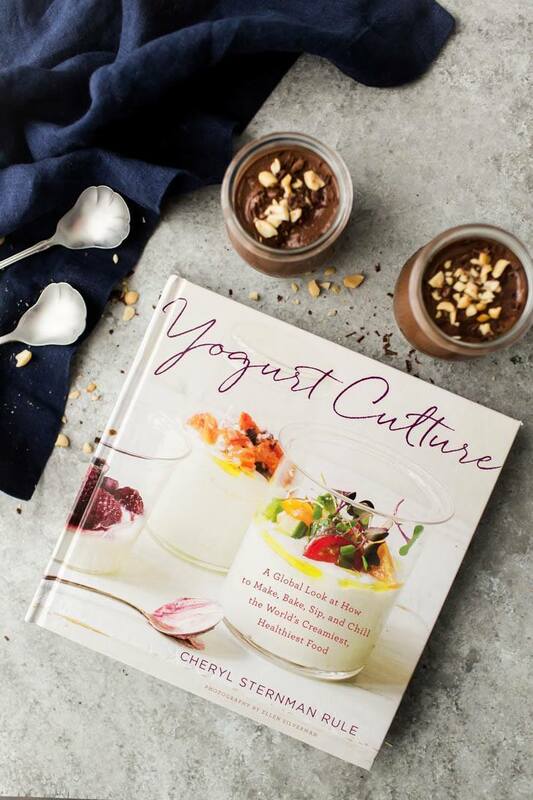 I think one of the things I love most about this book is how Cheryl explores yogurt within different cultures around the world. Yogurt is one of those ingredients that is pervasive in many cultures and so it is fascinating and inspiring to learn about new uses from a myriad of cultures. Recipes I’m excited to try: When I went to the book party, Cheryl had brought with her a spread from the book. I was able to sample the Greek Yogurt with Lemon Vinaigrette, her homemade yogurt with different compotes, a delightful coffee concentrate, Eggplant Tahini Dip, and Labneh-Dimpled Brownie Tart. Get more information on Cheryl’s blog, 5 Second Rule and the official Team Yogurt website. In a double boiler, heat the chocolate over barely simmering water, stirring until smooth. Turn off the heat but leave the chocolate over the warm water. 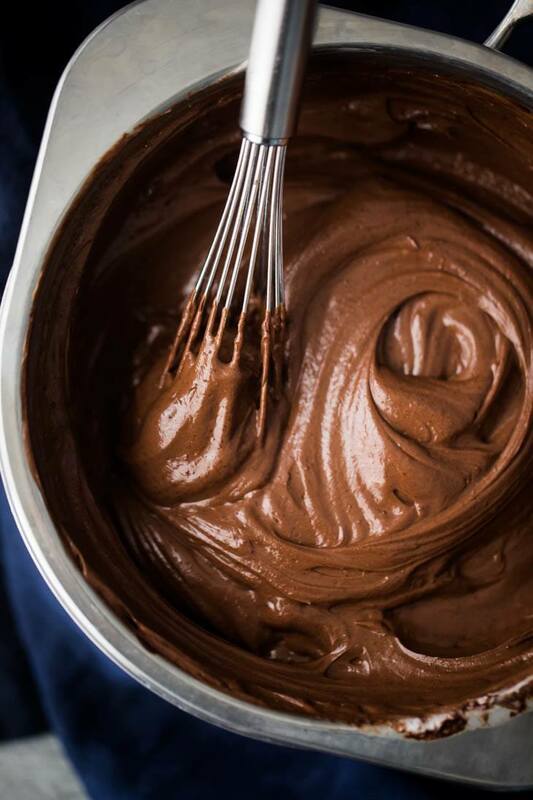 Slowly stir in the yogurt to the chocolate, eventually switching to a whisk. The goal is to do it at a pace that doesn’t seize up the chocolate but allows the yogurt to warm up and meld with the chocolate. Once the mixture is smooth, whisk in the vanilla and salt. Taste and add sweetener if desired (see note). In a small bowl, whisk together the 1/4 cup yogurt with peanut butter and honey. If peanut butter is cold/thick, heat briefly to loosen. Pour half the chocolate yogurt into five jars, around 4 ounces each. Scoop of spoonful of the peanut butter into the middle of each jar, then top with remaining yogurt. Place the yogurt in the refreigerator and allow to chill for 1 hour. Top with peanuts and chocolate before serving. + You may be tempted, as I was, to try dark chocolate in place of the milk chocolate. While it works, it’s slightly tart and in my mind, requires quite a bit of extra sweetener. + I used honey across the board to sweeten the pots but I like the flavor of honey and chocolate together. 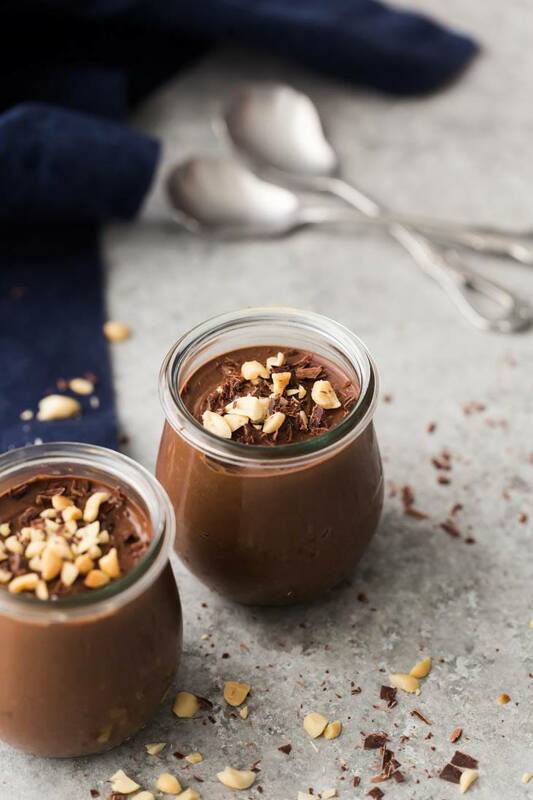 +If you would like to make Cheryl’s original recipe (without the peanut butter middle), use 2 cups yogurt and 8 ounces of chocolate for the base and ditch the peanut butter/honey. + Recipe from Yogurt Culture by Cheryl Sternman Rule. These look absolutely delish – I’ll will have to try them this week! I love yogurt and I love chocolate. This is a must try! Chocolate yogurt?! Oh yummy yum yum! What a clever and easy dessert. I imagine the yogurt gives a really nice tang. Will definitely be making these!! Nothing beats that chocolate and peanut butter combo! This looks so rich and yummy! Thanks for introducing Cheryl’s book — looks awesome. Can’t wait to make this fabulous dessert! I love chocolate and peanut butter so I need to try these and they’re gluten free! These look very nutritious and delicious! mmmm… These look so yummy i need to try this recipe! Yum. These look so good. I will be making these this week!! Everything I’ve seen from this book so far looks amazing! These are no exception. So creamy and chocolatey, yes please! You don’t have to be a chocolate lover to appreciate this one! I will definitely bookmark this to try. I’m dying to dig into that chocolatey goodness! These look absolutely perfect for breakfast (or dessert)! Made these today and… WOW! Epic. Truly epic. Made with Almond Butter instead of PB, and my feller said, “Make these again soon please.” 10-4 Big Daddy. Will do! YES! So glad you both loved them! This looks amazing!! Definitely going to try. Do you think this would go well with coconut shavings? Could you use Cocoa powder in the place of milk or dark chocolate instead, would it be healthier? It wouldn’t be as good- the chocolate really makes the texture. 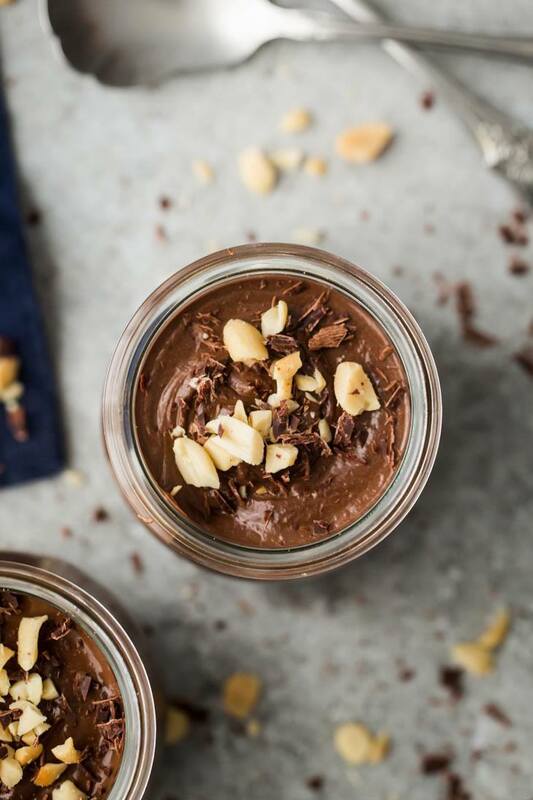 Will this recipe work with cocoa powder, and would it be healthier and taste the same?